Jaws is a 1975 American thriller film directed by Steven Spielberg and based on Peter Benchley's 1974 novel of the same name. In the story, a giant man-eating great white shark attacks beachgoers on Amity Island, a fictional New England summer resort town, prompting the local police chief to hunt it with the help of a marine biologist and a professional shark hunter. The film stars Roy Scheider as police chief Martin Brody, Robert Shaw as shark hunter Quint, Richard Dreyfuss as oceanographer Matt Hooper, Murray Hamilton as Larry Vaughn, the mayor of Amity Island, and Lorraine Gary as Brody's wife, Ellen. The screenplay is credited to both Benchley, who wrote the first drafts, and actor-writer Carl Gottlieb, who rewrote the script during principal photography. During a late-night beach party on Amity Island, a young woman goes swimming in the ocean. While treading water, she is violently pulled under. The next morning, her partial remains are found on shore. The medical examiner ruling the death a shark attack leads Police Chief Martin Brody to close the beaches. Mayor Larry Vaughn overrules him, fearing it will ruin the town's summer economy. The coroner now concurs with the mayor's theory that the girl was killed in a boating accident. Brody reluctantly accepts their conclusion until another fatal shark attack occurs shortly after. Amid an amateur shark-hunting frenzy, local professional shark hunter Quint offers his services for $10,000. Meanwhile, consulting oceanographer Matt Hooper examines the first victim's remains and concludes the death was from a shark attack. When local fishermen catch a large tiger shark, the mayor proclaims the beaches safe. Hooper disputes it being the same predator, confirming this after no human remains are found inside it. Hooper and Brody find a half-sunken vessel while searching the night waters in Hooper's boat. Underwater, Hooper retrieves a sizable great white shark's tooth embedded in the submerged hull. He drops it after finding a partial corpse. Vaughn discounts Brody and Hooper's claims that a huge great white shark is responsible and refuses to close the beaches, allowing only added safety precautions. On the Fourth of July weekend, tourists pack the beaches. Following a juvenile prank, the real shark enters a nearby estuary, killing a boater and causing Brody's son, Michael, to go into shock. Brody finally convinces a devastated Vaughn to hire Quint. Quint, Brody, and Hooper set out on Quint's boat, the Orca, to hunt the shark. While Brody lays down a chum line, Quint waits for an opportunity to hook the shark. Without warning, it appears behind the boat. Quint estimates the shark's length at 25 feet (7.6 m) and harpoons a barrel into it, but it drags the barrel underwater and disappears. At nightfall, as the three swap stories, the great white returns unexpectedly, ramming the boat's hull and killing the power. The men work through the night repairing the engine. In the morning, Brody attempts to call the Coast Guard, but Quint smashes the radio, enraging Brody. After a long chase, Quint harpoons another barrel into the shark. The line is tied to the stern, but the shark drags the boat backwards, swamping the deck and flooding the engine compartment, forcing Quint to sever the line to prevent the transom from being pulled out. He then heads toward shore, intending to lure the shark to shallower waters and suffocate it, but the overtaxed engine quits. With the Orca slowly sinking, the trio attempt a riskier approach: Hooper dons scuba gear and enters the water in a shark-proof cage, intending to lethally inject the shark with strychnine using a hypodermic spear. The shark demolishes the cage before Hooper can inject it, but he manages to escape to the seabed. The shark then attacks the boat directly, crushing the transom and devouring Quint. Trapped on the sinking vessel, Brody stuffs a pressurized scuba tank into the shark's mouth, and, climbing the mast, shoots the tank with Quint's rifle. The resulting explosion obliterates the shark. 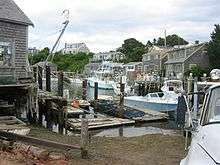 Hooper resurfaces, and he and Brody paddle to Amity Island clinging to boat wreckage. Richard D. Zanuck and David Brown, producers at Universal Pictures, independently heard about Peter Benchley's novel Jaws. Brown came across it in the literature section of lifestyle magazine Cosmopolitan, then edited by his wife, Helen Gurley Brown. A small card written by the magazine's book editor gave a detailed description of the plot, concluding with the comment "might make a good movie". The producers each read the book over the course of a single night and agreed the next morning that it was "the most exciting thing that they had ever read" and that they wanted to produce a film version, although they were unsure how it would be accomplished. They purchased the movie rights in 1973, before the book's publication, for approximately $175,000 (equivalent to $0.93 million in 2015). Brown claimed that had they read the book twice, they would never have made the film because they would have realized how difficult it would be to execute certain sequences. Three full-size pneumatically powered prop sharks—which the film crew nicknamed "Bruce" after Spielberg's lawyer, Bruce Ramer—were made for the production: a "sea-sled shark", a full-body prop with its belly missing that was towed with a 300 feet (91 m) line, and two "platform sharks", one that moved from camera-left to -right (with its hidden left side exposing an array of pneumatic hoses), and an opposite model with its right flank uncovered. The sharks were designed by art director Joe Alves during the third quarter of 1973. Between November 1973 and April 1974, the sharks were fabricated at Rolly Harper's Motion Picture & Equipment Rental in Sun Valley, California. Their construction involved a team of as many as 40 effects technicians, supervised by mechanical effects supervisor Bob Mattey, best known for creating the giant squid in 20,000 Leagues Under the Sea. After the sharks were completed, they were trucked to the shooting location. In early July, the platform used to tow the two side-view sharks capsized as it was being lowered to the ocean floor, forcing a team of divers to retrieve it. The model required 14 operators to control all of the moving parts. The underwater scenes shot from the shark's point of view have been compared with passages in two 1950s horror films, The Creature from the Black Lagoon and The Monster That Challenged the World. Gottlieb named two science fiction productions from the same era as influences on how the shark was depicted, or not: The Thing from Another World, which Gottlieb described as "a great horror film where you only see the monster in the last reel"; and It Came From Outer Space, where "the suspense was built up because the creature was always off-camera". Those precedents helped Spielberg and Gottlieb to "concentrate on showing the 'effects' of the shark rather than the shark itself". Scholars such as Thomas Schatz described how Jaws melds various genres while essentially being an action film and a thriller. Most is taken from horror, with the core of a nature-based monster movie while adding elements of a slasher film. The second half provides a buddy film in the interaction between the crew of the Orca, and a supernatural horror based on the shark's depiction of a nearly Satanic menace. The glowing audience response to a rough cut of the film at two test screenings in Dallas on March 26, 1975, and one in Long Beach, on March 28, along with the success of Benchley's novel and the early stages of Universal's marketing campaign, generated great interest among theater owners, facilitating the studio's plan to debut Jaws at hundreds of cinemas simultaneously. A third and final preview screening, of a cut incorporating changes inspired by the previous presentations, was held in Hollywood on April 24. After Universal chairman Lew Wasserman attended one of the screenings, he ordered the film's initial release—planned for a massive total of as many as 900 theaters—to be cut down, declaring, "I want this picture to run all summer long. I don't want people in Palm Springs to see the picture in Palm Springs. I want them to have to get in their cars and drive to see it in Hollywood." Nonetheless, the several hundred theaters that were still booked for the opening represented what was then an unusually wide release. At the time, wide openings were associated with movies of doubtful quality; not uncommon on the exploitation side of the industry, they were customarily employed to diminish the effect of negative reviews and word of mouth. There had been some recent exceptions, including the rerelease of Billy Jack and the original release of its sequel The Trial of Billy Jack, the Dirty Harry sequel Magnum Force, and the latest installments in the James Bond series. Still, the typical major studio film release at the time involved opening at a few big-city theaters, which allowed for a series of premieres. Distributors would then slowly forward prints to additional locales across the country, capitalizing on any positive critical or audience response. The outsized success of The Godfather in 1972 had sparked a trend toward wider releases, but even that film had debuted in just five theaters, before going wide in its second weekend. Jaws set the template for many subsequent horror films, to the extent that the script for Ridley Scott's 1979 science fiction film Alien was pitched to studio executives as "Jaws in space". Many films based on man-eating animals, usually aquatic, were released through the 1970s and 1980s, such as Orca, Grizzly, Mako: The Jaws of Death, Barracuda, Alligator, Day of the Animals, Tintorera, Eaten Alive, and the 1996 Bollywood film Aatank. Spielberg declared Piranha, directed by Joe Dante and written by John Sayles, "the best of the Jaws ripoffs". Among the various foreign mockbusters based on Jaws, three came from Italy: Great White, which inspired a plagiarism lawsuit by Universal and was even marketed in some countries as a part of the Jaws franchise; Monster Shark, featured in Mystery Science Theater 3000 under the title Devil Fish; and Deep Blood, that blends in a supernatural element. The 1995 thriller film Cruel Jaws even has the alternate title Jaws 5: Cruel Jaws, and the 2009 Japanese horror film Psycho Shark was released in the United States as Jaws in Japan. Jaws spawned three sequels, none of which approached the success of the original. Their combined domestic grosses amount to barely half of the first film's. In October 1975, Spielberg declared to a film festival audience that "making a sequel to anything is just a cheap carny trick". Nonetheless, he did consider taking on the first sequel when its original director, John D. Hancock, was fired a few days into the shoot; ultimately, his obligations to Close Encounters of the Third Kind, which he was working on with Dreyfuss, made it impossible. Jaws 2 (1978) was eventually directed by Jeannot Szwarc; Scheider, Gary, Hamilton, and Jeffrey Kramer all reprised their roles. It is generally regarded as the best of the sequels. The next film, Jaws 3-D (1983), was directed by Joe Alves, who had served as art director and production designer, respectively, on the two preceding films. Starring Dennis Quaid and Louis Gossett, Jr., it was released in the 3-D format, although the effect did not transfer to television or home video, where it was renamed Jaws 3. Jaws: The Revenge (1987), directed by Joseph Sargent, starring Michael Caine, and featuring the return of Gary, is considered one of the worst movies ever made. 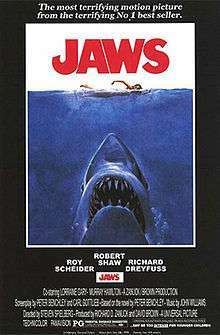 While all three sequels made a profit at the box office (Jaws 2 and Jaws 3-D were among the top 20 highest-grossing films of their respective years), critics and audiences alike were generally dissatisfied with the films. ↑ "JAWS (A)". British Board of Film Classification. June 12, 1975. Retrieved June 7, 2015. 1 2 3 4 Bouzereau, Laurent (1995). A Look Inside Jaws ["From Novel to Script"]. Jaws: 30th Anniversary Edition DVD (2005): Universal Home Video. ↑ Friedman & Notbohm 2000, p. 8. 1 2 3 4 5 Mark Salisbury; Ian Nathan. "Jaws: The Oral History". Empire. Retrieved March 23, 2015. 1 2 3 4 5 6 Pangolin Pictures (June 16, 2010). Jaws: The Inside Story (Television documentary). The Biography Channel. 1 2 3 4 5 6 Bouzereau, Laurent (1995). A Look Inside Jaws ["Casting "]. Jaws: 30th Anniversary Edition DVD (2005): Universal Home Video. ↑ Fischbach, Bob (May 20, 2010). "Bob's Take: 'Jaws' script doctor ruthless to character played by him". Omaha World-Herald. Retrieved March 6, 2012. 1 2 Bouzereau, Laurent (1995). A Look Inside Jaws ["Climax"]. Jaws: 30th Anniversary Edition DVD (2005): Universal Home Video. 1 2 3 4 Vespe, Eric (Quint) (June 6, 2011). "Steven Spielberg and Quint have an epic chat all about JAWS as it approaches its 36th Anniversary!". Ain't It Cool News. Retrieved January 2, 2012. 1 2 3 4 "Summer of the Shark". Time. June 23, 1975. Archived from the original on November 30, 2009. Retrieved November 9, 2011. ↑ Nadler 2006, p. 36. 1 2 3 4 5 Bouzereau, Laurent (1995). A Look Inside Jaws ["Production Stories"]. Jaws: 30th Anniversary Edition DVD (2005): Universal Home Video. ↑ Brannen, Peter (May 26, 2011). "Once Bitten: Islanders Reveal More Jaws". Vineyard Gazette. Retrieved July 7, 2015. 1 2 3 4 5 6 Harvey, Neil (June 13, 2005). "30 years of 'Jaws'". The Roanoke Times. Retrieved March 12, 2010. 1 2 Smith, Neil (June 3, 2005). "Shark tale that changed Hollywood". BBC News. Retrieved March 12, 2010. 1 2 Bouzereau, Laurent (1995). A Look Inside Jaws ["The Shark Is Not Working"]. Jaws: 30th Anniversary Edition DVD (2005): Universal Home Video. ↑ Nadler 2006, p. 36-37. ↑ Dreyfuss, Richard (December 6, 2012). "Tension Between Richard Dreyfuss and Robert Shaw in "JAWS"" (Interview). Interview with Steven Bratter. University of Copenhagen. Retrieved June 6, 2015. ↑ Davies, Nathan (19 June 2015). "How a big shark and a little man forced Spielberg to make Jaws even better". The Advertiser. Retrieved 21 January 2016. ↑ "Interview with Richard Dreyfuss". The Shark Is Still Working official website. Archived from the original on March 7, 2008. Retrieved March 11, 2010. 1 2 "The 48th Academy Awards (1976) Nominees and Winners". Academy of Motion Picture Arts and Sciences. Retrieved October 2, 2011. 1 2 "AFI's 100 YEARS OF FILM SCORES". American Film Institute. Retrieved January 2, 2012. ↑ Matessino, Michael (September 24, 1999). "Letter in response to "A Study of Jaws' Incisive Overture To Close Off the Century"". Film Score Monthly. Retrieved December 17, 2006. 1 2 3 Tylski, Alexandre. "A Study of Jaws' Incisive Overture To Close Off the Century". Film Score Monthly. Retrieved August 26, 2006. ↑ Chaundy, Bob (November 6, 2006). "Spies, sports, and sharks". BBC News. Retrieved November 6, 2006. ↑ Scheurer, Timothy E. (March 1, 1997). "John Williams and film music since 1971". Popular Music and Society. 21 (1): 59–72. doi:10.1080/03007769708591655. ISSN 0300-7766. 1 2 3 Berardinelli, James (2002). "Jaws". Reelviews. Retrieved August 6, 2006. 1 2 Freer, Ian. "Empire's Jaws Soundtrack Review". Empire. Retrieved January 5, 2012. 1 2 "Jaws – 25th Anniversary Collector's Edition". Decca Classics. Archived from the original on October 6, 2003. Retrieved January 2, 2012. ↑ "Jaws". Varèse Sarabande. Retrieved January 1, 2012. ↑ Biskind, Peter (1975). "Jaws: Between the teeth". Jump Cut (9): 1–29. ↑ Hagen, Dan (January 1988). "Neal Gabler". Comics Interview (54). Fictioneer Books. pp. 61–63. ↑ Horovitz, Bruce (July 21, 2003). "Poster king dreams up images to grab audiences". USA Today. Retrieved January 2, 2012. 1 2 3 4 5 "Jaws–The Monster That Ate Hollywood". PBS. 2001. Retrieved August 6, 2006. ↑ Pisani, Joseph (May 22, 2006). "The Biggest Summer Blockbusters". Business Week. Archived from the original on January 25, 2010. Retrieved September 20, 2009. ↑ Ayres, Alice; Fordham, Alice (February 14, 2006). "Man who gave summer blockbuster its bite dies". The Times. Retrieved March 12, 2010. ↑ Siska 1980, p. 125 This, the most detailed source, gives contradictory figures. The totals can variously be interpreted as 675 or 695 for July 25, and 954 or 974 for August 15. ↑ THR Staff (May 28, 2015). "'Jaws' Returning to Theaters for 40th Anniversary". The Hollywood Reporter. (Prometheus Global Media). Retrieved May 28, 2015. ↑ "'TCM Presents' Continues with JAWS 40th Anniversary Presentation in Select U.S. Movie Theaters This June". Business Insider. May 28, 2015. Retrieved May 28, 2015. 1 2 "Jaws (1975)". Box Office Mojo. Retrieved March 12, 2010. 1 2 Morris 2007, p. 44. 1 2 Anderson, George (January 21, 1980). "Buffs Give Damn About 'Wind' Change". Pittsburgh Post-Gazette. p. 24. ↑ Los Angeles (AP) (September 10, 1975). "'Jaws' Receipts Most in U.S. Film History". The Daytona Beach News-Journal. p. 14A. ↑ ""Jaws" breaks b.o. mark in Singapore". Variety (285): 34. December 8, 1976. ↑ ""Jaws" chomps into new b.o. marks at N. Zealand, Japan". Variety (281): 33. January 28, 1976. ↑ ""Jaws" in Spain: record $3.3-mil". Variety (282): 3. February 18, 1976. ↑ ""Jaws" openings break all Mexican records". Box Office (109): 8. May 3, 1976. ↑ Weiler, A. H. (April 14, 1975). "Evans Quits as Executive at Paramount". The New York Times. Retrieved January 27, 2012. ↑ Fenner, Pat. C. (January 16, 1978). "Independent Action". Evening Independent. p. 11–A. ↑ "All Time Box Office". Box Office Mojo. Retrieved January 31, 2012. ↑ The Economist online (July 11, 2011). "Pottering on, and on – Highest-grossing film in franchise". The Economist. Retrieved March 17, 2012. ↑ "All Time Box Office Adjusted for Ticket Price Inflation". Box Office Mojo. Retrieved January 26, 2012. ↑ "All Time Box Office Adjusted for Ticket Price Inflation:Est. Tickets". Box Office Mojo. Retrieved January 26, 2012. ↑ "3.2 Inflation-adjusted top 20 films at the UK box office". Statistical Yearbook 2011. British Film Institute. 2011. p. 24. Retrieved February 26, 2012. ↑ "The Ultimate Chart: 1–100". British Film Institute. 2004. Archived from the original on January 31, 2010. Retrieved February 26, 2012. ↑ "Universal City Studios, Inc. v. Montgomery Ward & Co., Inc". United States Patents Quarterly. Bureau of National Affairs. 207 (851). 1980. ↑ Brown, Les (November 7, 1979). ""Jaws" played to 80 million on ABC". The New York Times. p. C29. ↑ Boshoff, Alison (February 7, 1998). "TV's jewels fail to shine in list of all-time winners". The Daily Telegraph. Retrieved May 4, 2011. ↑ "Detail view of movies: Jaws". American Film Institute. Retrieved January 20, 2012. ↑ Ebert, Roger (January 1, 1975). "Jaws". Chicago Sun-Times. Retrieved August 3, 2006. ↑ Murphy, A.D. (June 18, 1975). "Jaws". Variety. Retrieved August 3, 2006. ↑ Crist, Judith (June 23, 1975). "Fish Story On a Grand Scale". New York. Retrieved August 3, 2006. ↑ Reed, Rex (June 15, 1975). "Film to Jaw About: 'Le Chat's' Meow". New York Daily News. ↑ Canby, Vincent (June 21, 1975). "Entrapped by 'Jaws' of Fear". The New York Times. Retrieved August 3, 2006. ↑ Champlin, Charles (June 20, 1975). "Don't Go Near the Water". The Los Angeles Times. Retrieved August 31, 2006. 1 2 Magill, Marcia (August–September 1975). "Jaws". Films in Review: 436. ↑ Halliwell's Film Guide, 13th edition – ISBN 0-00-638868-X. ↑ "Past Winners Search". National Academy of Recording Arts and Sciences. Retrieved January 5, 2012. 1 2 "Film Nominations 1975". British Academy of Film and Television Arts. Retrieved February 26, 2012. 1 2 "33rd Annual Golden Globe Awards Nominations". Hollywood Foreign Press Association. Retrieved January 28, 2011. ↑ "Fact Sheet: Jaws". E! Entertainment Television. Archived from the original on March 19, 2005. Retrieved January 5, 2012. ↑ "And the 2nd Annual "Favorite Movie People's Choice" is ... Jaws!". People's Choice Awards. Retrieved January 5, 2012. ↑ "Awards / History / 1975 – 28th Annual DGA Awards". Directors Guild of America. Retrieved January 5, 2012. ↑ "Writers Guild Foundation Library Catalog: Jaws". Writers Guild of America, West. Retrieved January 5, 2012. ↑ "AFI's 100 Years... 100 Movies – 10th Anniversary Edition". American Film Institute. Retrieved January 3, 2012. ↑ "AFI's 100 Years... 100 Movies (10th Anniversary Edition)". American Film Institute. Retrieved August 17, 2010. ↑ "AFI's 100 Years... 100 Heroes & Villains". American Film Institute. Retrieved August 17, 2010. ↑ "AFI's 100 Years... 100 Quotes". American Film Institute. Retrieved August 17, 2010. ↑ "AFI's 100 Years... 100 Thrills". American Film Institute. Retrieved January 2, 2012. ↑ "The Best 1,000 Movies Ever Made". The New York Times. April 29, 2003. Retrieved July 4, 2010. ↑ "The 100 Scariest Movie Moments: 100 Scariest Moments in Movie History—Official Bravo TV Site". Bravo Company. 2004. Archived from the original on October 30, 2007. Retrieved July 28, 2010. ↑ "CFCA's 100 Scariest Movies of All Time". Chicago Film Critics Association. Archived from the original on December 5, 2006. Retrieved July 2, 2010. ↑ "Empire's The 100 Greatest Movie Characters". Empire. Retrieved May 21, 2010. ↑ "Film Four's 100 Greatest Films of All Time". Film4. Published by AMC FilmSite.org. Retrieved August 17, 2010. ↑ Travers, Peter (December 1999). "100 Maverick Movies". Rolling Stone (830/831). Retrieved January 15, 2011. ↑ "Total Film features: 100 Greatest Movies Of All Time". Total Film. January 25, 2010. Retrieved August 17, 2010. ↑ "50 Greatest Movies (on TV and Video)". TV Guide: 14–33. August 8–14, 1998. Retrieved January 15, 2011. ↑ "50 Greatest Films". Vanity Fair. September 2005. Retrieved January 15, 2011. ↑ "Librarian of Congress Names 25 More Films to National Film Registry" (Press release). Library of Congress. December 18, 2001. Retrieved March 11, 2010. ↑ "101 Best Screenplays". Writers Guild of America, West. April 7, 2006. Retrieved July 4, 2010. ↑ "Rise of the Blockbuster". BBC News. November 16, 2001. Retrieved March 12, 2010. ↑ Fisher, Luchina (June 18, 2010). "Jaws' Launched Summer Blockbuster 35 Years Ago". ABC News. Retrieved January 14, 2011. ↑ Lovgren, Stefan (June 15, 2005). ""Jaws" at 30: Film Stoked Fear, Study of Great White Sharks". National Geographic. Retrieved March 12, 2010. ↑ Fleshler, David (October 31, 2010). "One-third of world's sharks, skates and rays face extinction". Sun Sentinel. Retrieved January 11, 2010. ↑ Metcalf, Geoff. "Great white shark, the fragile giant". geoffmetcalf.com. Retrieved August 4, 2006. ↑ Chapple, Mike (September 1, 2005). "Great white hope". Liverpool Daily Post. p. 3. Retrieved March 11, 2010. ↑ Hays, Matthew. "A Space Odyssey". Montreal Mirror. Archived from the original on June 5, 2011. Retrieved July 31, 2007. ↑ Wheeler, Jeremy. "Deep Blood (1990)". Allrovi. Retrieved January 2, 2012. ↑ Begg, Ken (August 27, 2012). "Cruel Jaws (1995)". Jabootu's Bad Movie Dimension. Retrieved July 31, 2014. ↑ Lamar, Cyriaque (September 13, 2010). ""Jaws in Japan" promises cyclopean Selachimorphae, breasts". Jabootu's Bad Movie Dimension. Retrieved July 31, 2014. 1 2 Dutka, Elaine (June 14, 2005). "Making this cold fish hot again". The Los Angeles Times. Retrieved January 5, 2012. 1 2 Kramer Bussel, Rachel (August 15, 2012). "Jaws Fanatics Gather to Pray to God of Sharks". Vulture. Retrieved January 4, 2013. ↑ Hollander, Erik. "First look: 'The Shark is Still Working'". Los Angeles United Film Festival. Archived from the original on April 17, 2009. Retrieved January 1, 2012. ↑ "The Shark is Still Working official website". Archived from the original on August 11, 2010. Retrieved January 5, 2012. ↑ McGowan, Chris (July 7, 1992). "LaserScans". Billboard: 65. Retrieved January 1, 2012. ↑ McGowan, Chris (March 23, 1996). "LaserDisk Karaoke: In Titles". Billboard: 62–63. Retrieved January 1, 2012. ↑ Nielsen Business Media, Inc (July 26, 1980). "Video Shark". Billboard: 64. Retrieved January 1, 2012. ↑ Nashawaty, Chris (December 1, 1995). "Jaws (1995)". Entertainment Weekly. Retrieved January 5, 2012. 1 2 Fitzpatrick, Eileen (May 13, 2000). "Spielberg Releases 'Jaws' on DVD as Universal Marks Shark's 25th Anniversary". Billboard: 132. Retrieved January 1, 2012. ↑ King, Susan (July 13, 2000). "Feeding 'Jaws' Fans". The Los Angeles Times. Retrieved January 5, 2012. ↑ Venendaal, Matt (July 11, 2000). "Jaws: 25th Anniversary Edition". IGN. Retrieved April 15, 2010. ↑ Fitzpatrick, Eileen (August 5, 2000). "Universal 'Jaws' DVD Ships One Million Plus; Spinal Tap Seeks Drummer Through Listen.com". Billboard: 85. Retrieved January 1, 2012. ↑ "Jaws (12)". Total Film. August 29, 2005. Retrieved April 15, 2010. ↑ Chitwood, Adam (April 10, 2012). "Universal Confirms Digitally Remastered JAWS Coming to Blu-ray August 14; Watch Steven Spielberg Talk About the Restoration". Collider. Retrieved April 11, 2012. ↑ Arnold, Thomas K. (August 22, 2012). "'Hunger Games' Sweeps Sales and Rental Charts". Home Media Magazine. Retrieved March 9, 2013. ↑ "Jaws Movies". Box Office Mojo. Retrieved March 12, 2010. ↑ "Joe Alves and Jaws 3-D". Fangoria (1): 29. August 1979. ↑ Franich,Darren; Staskiewicz, Keith (August 20, 2010). "Introducing the PopWatch Rewind! Week 1: 'Jaws 3-D'". Entertainment Weekly. Retrieved January 4, 2012. ↑ Nashawaty, Chris. "The 25 Worst Sequels Ever Made – 10. Jaws: The Revenge (1987)". Entertainment Weekly. Retrieved March 11, 2010. ↑ "1987 Archive". Golden Raspberry Awards. Retrieved December 11, 2006. ↑ "Jaws". Universal Orlando. Archived from the original on October 10, 2009. Retrieved January 2, 2012. ↑ Bevil, Dewayne (January 2, 2012). "It's the end of the line for Jaws at Universal". Orlando Sentinel. Retrieved January 3, 2012. ↑ "Jaws". Universal Japan. Retrieved April 15, 2010. ↑ Sutherland, Sam (May 2, 2007). "Giant Killer Shark And Other Meta-Musicals". AOL Music. Archived from the original on June 20, 2007. Retrieved April 15, 2010. ↑ "Jaws (1987)". GameSpot. Retrieved January 1, 2012. ↑ Dunham, Jeremy (May 23, 2006). "JAWS Ships Out". IGN. Retrieved January 1, 2012. ↑ Makuch, Eddie (June 2, 2011). "Jaws: Ultimate Predator chomping Wii, 3DS". GameSpot. Retrieved January 1, 2012. ↑ "Jaws Surfaces on the iTunes App Store". IGN. August 19, 2006. Retrieved January 1, 2012. ↑ "Aristocrat's newest Hyperlink Slot, JAWS™ makes world premiere at Sycuan Casino" (PDF). Aristocrat. May 8, 2009. Retrieved September 15, 2011. Andrews, Nigel (1999). Nigel Andrews on Jaws. London: Bloomsbury Publishing. ISBN 0-7475-3975-8. Baer, William (2008). Classic American Films: Conversations with the Screenwriters. Westport, Connecticut: Greenwood. ISBN 0-313-34898-7. Biskind, Peter (1998). Easy Riders, Raging Bulls. New York: Simon & Schuster. ISBN 0-684-85708-1. Britton, Andrew (1979). "Jaws". In Grant, Barry Keith. Britton on Film: The Complete Film Criticism of Andrew Britton. (2009). Detroit: Wayne State University Press. ISBN 0-8143-3363-X. Brode, Douglas (1995). The Films of Steven Spielberg. New York: Carol Publishing. ISBN 0-8065-1951-7. Brosnan, John (1978). Future Tense: The Cinema of Science Fiction. London: Macdonald and Jane's. ISBN 0-354-04222-X. Burr, Ty (1999). The 100 Greatest Movies of All Time. New York: Entertainment Weekly Books. ISBN 1-883013-68-2. Collins, Jim; Radner, Hilary (1993). Film Theory Goes to the Movies. London: Routledge. ISBN 0-415-90576-1. Gordon, Andrew (2008). Empire of Dreams: The Science Fiction and Fantasy Films of Steven Spielberg. Lanham, Maryland: Rowman & Littlefield. ISBN 0-7425-5578-X. Gottlieb, Carl (2005). The Jaws Log. New York: Newmarket Press. ISBN 0-571-20949-1. Heath, Stephen (1976). "Jaws, Ideology, and Film Theory". In Nichols, Bill. Movies and Methods: An Anthology, Volume II. (1985). Berkeley: University of California Press. ISBN 0-520-05408-3. Jackson, Kathi (2007). Steven Spielberg: A Biography. Westport, Connecticut: Greenwood. ISBN 0-313-33796-9. Jameson, Fredric (1979). "Reification and Utopia in Mass Culture". Signatures of the Visible. New York and London: Routledge. ISBN 978-0-415-90012-6. JSTOR 466409. Kael, Pauline (1976). "Notes on Evolving Heroes, Morals, Audiences". When the Lights Go Down. (1980). Beverly, Massachusetts: Wadsworth. ISBN 0-03-056842-0. Kochberg, Searle (1996). "Institutions, Audiences and Technology". In Nelmes, Jill. An Introduction to Film Studies. London: Routledge. ISBN 0-415-10860-8. Lemkin, Jonathan (1984). "Archetypal Landscapes and Jaws". In Grant, Barry Keith. Planks of Reason: Essays on the Horror Film. Lanham, Maryland: Scarecrow Press. ISBN 0-8108-2156-7. Maltin, Leonard (1999). "100 Must-See Films of the 20th Century". Leonard Maltin's Movie & Video Guide 2000. New York: Penguin Group. ISBN 0-452-28123-7. Moritz, Charles (1978). Current Biography Yearbook 1978. New York: H. W. Wilson. ISBN 99973-770-2-8. Morris, Nigel (2007). The Cinema of Steven Spielberg: Empire of Light. New York: Wallflower Press. ISBN 1-904764-88-6. Muir, John Kenneth (2007). Horror Films of the 1970s, Volume 2. Jefferson, North Carolina: McFarland. ISBN 0-7864-3104-0. Ochoa, George (2011). Deformed and Destructive Beings: The Purpose of Horror Films. McFarland. ISBN 0-7864-6307-4. Paszylk, Bartłomiej (2009). The Pleasure and Pain of Cult Horror Films: An Historical Survey. Jefferson, North Carolina: McFarland. ISBN 0-7864-3695-6. Priggé, Steven (2004). Movie Moguls Speak: Interviews with Top Film Producers. Jefferson, North Carolina: McFarland. ISBN 0-7864-1929-6. Shone, Tom (2004). Blockbuster: How Hollywood Learned to Stop Worrying and Love the Summer. New York: Simon & Schuster. ISBN 0-7432-3568-1. Sinyard, Neil (1989). The Films of Steven Spielberg. London: Hamlyn Bison. ISBN 0-600-55226-8. Turner, Graeme (1999). Film as Social Practice. London: Routledge. ISBN 0-415-21595-1. Wyatt, Justin (1998). "From Roadshowing to Saturation Release: Majors, Independents, and Marketing/Distribution Innovations". In Lewis, Jon. The New American Cinema. Durham, North Carolina: Duke University Press. ISBN 0-8223-2115-7.